Please introduce yourself (what is your current training/educational status and/or where do you work?) and share with us how you decided to get into scientific visualization. I’m a faculty member in the Master of Science in Biomedical Communications (MScBMC) graduate program at the University of Toronto. I currently teach courses on web-based health and science communication, interactive media design and development, and biomolecular visualization. My research interests lie in the intersection of data visualization/interaction and molecular biology. I decided to pursue scientific visualization as a career path after learning about it through a former graduate of the BMC program. 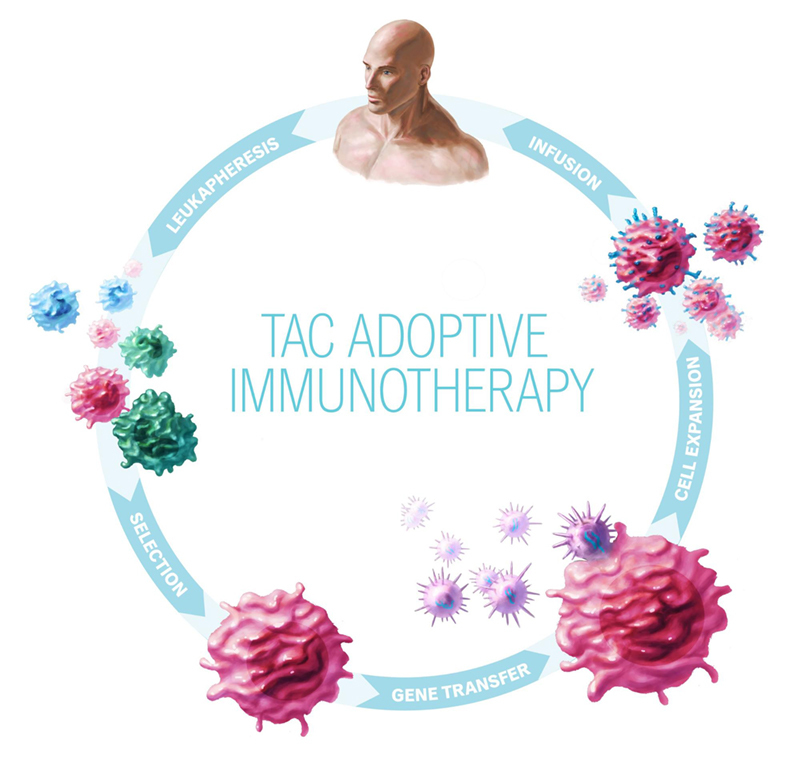 Sample 1: Molecular mechanism behind a novel approach for adoptive immunotherapy. The biggest barrier for me was (and still is) developing the confidence/experience in running a freelance visualization business. This role requires wearing many hats such as client/project management, pricing/quoting, marketing, and negotiating contracts, in addition to the actual work of designing and creating the project deliverables. Many of these skills come with practice. However, I found that the MScBMC business practice course, in addition to the many business resources and mentoring opportunities available through the Association of Medical Illustrators (AMI), made it easier for me to make the jump and “get my feet wet”. AMI Annual Meeting – This was my first exposure to the professional realm of our field. It opened my mind and served as an inspirational springboard in terms of what “visualization” can entail. I like that it’s a small conference which makes it easier for beginners to network and learn from the more experienced members of our field. FITC – This conference focuses on issues, technologies, and topics relevant for digital creators. Although it isn’t directly related to our field, it allows me to keep up with the latest developments in interactive media design. I usually come away from it excited and full of ideas on how I might integrate these new developments to solve communication problems in our field. Sample 2: Molecular mechanism behind a novel approach for adoptive immunotherapy. If there was one resource, tool or conference that you could wish for to facilitate your work, what would it be? I would appreciate more resources on the business side of designing/developing interactive media vs. traditional media (illustrations and animations). For example, project requirements gathering, working with programmers, copyright issues, and pricing. What other advice would you offer those interested in either a professional or full-time academic career in scientific visualization? There are multiple ways to get into and involved with scientific visualization. My advice would be to talk to as many different people in our field as you can. Some questions you might want to ask: how did they get to where they are today? What would they do differently? Are your career goals achievable given your existing skill set? Which areas would you need to further develop? How might you do that most effectively? How do you feel your PhD training has an impact on your scientific visualization work? What specific skills from your PhD training have empowered you in your scientific visualization work? Do you think your PhD training has given you a unique perspective on viewing, interpreting, and creating scientific visualizations? My PhD training has significantly impacted my scientific visualization work in multiple ways including learning to tackle and manage large projects, quickly familiarize myself with relevant scientific literature, and teach myself new skills in a short time period. In terms of domain knowledge, my training in biochemistry gives me an advantage of knowing when, where, and how to acquire, evaluate, and integrate molecular data/information into my molecular visualization work. In addition, I think that being a domain expert gives you unique insights into the specific scientific communication problems that exist in your domain. I try to leverage these insights as well as the pool of scientific contacts I’ve made during graduate school to develop new client projects. Can you provide a specific example/situation of where you think your PhD training changed the way you designed something, interacted with someone or navigated a situation? My academic journey and training have served as an idea springboard for several projects that I’m working/collaborating on. For example, I’m currently designing new ways of co-visualizing and interacting with protein structural and functional data so that biomolecular scientists can gain insights that would be difficult to attain through more traditional data visualization means – this idea originated from the difficulties I had with existing tools/methods during the data analysis phase of my PhD thesis. Another example comes from my days as a teaching assistant for an undergraduate biochemistry class. I remembered students having difficulties relating the abstract mathematical equations of enzyme kinetics to the molecular phenomena being described. This lead to me to initiating and collaborating on a project with two MScBMC graduate students and a biochemistry professor to create both an animation and interactive learning tool to address this specific communication/teaching problem. Sample 3: Data visualization tool aimed at visualizing correlations between protein structural and functional data. The first two images were created as part of a larger illustration series for a local biotech start-up. 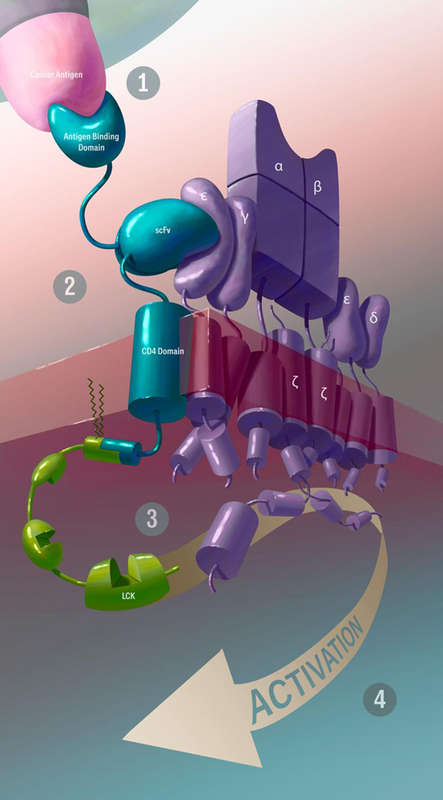 The illustrations were aimed at educating/promoting the molecular mechanism behind a novel approach for adoptive immunotherapy to non-domain specialists. I’m particularly proud of these illustrations as they were created for my first professional client after BMC. The last image is a screenshot from a data visualization tool I’m currently designing/developing aimed at making it easier for biomolecular researchers to visualize correlations between protein structural and functional data. Where do you think the field of scientific visualization is ‘going’? Do you perceive any trends in its evolution or are there certain directions that you would like to see implemented? I think there is room for non-linear, interactive storytelling/media to further develop in scientific visualization, especially given the rise and rapid expansion of technologies such as virtual/augmented reality (VR/AR). How much control can/should we give the user in creating their own narratives while keeping their experience educational? What aspects of traditional, linear storytelling can we adapt for these new digital environments? What role(s) should/do we play when working as part of cross-disciplinary teams needed to create these experiences? And then let’s end with a simple question… What is your ‘10 year plan’ in terms of what you hope to accomplish in scientific visualization?! I hope to develop new data visualization/interaction tools and methods that make it easier for biomolecular scientists to gain insights when exploring their molecular structural and functional data. I’d also like to explore the use of VR/AR in storytelling.